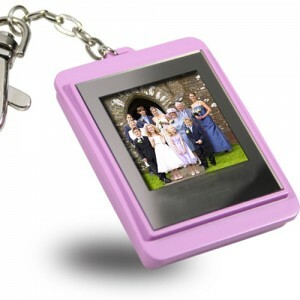 I recently received a Digital Photo Keychain from Wholesalekeychain.com to review. I have pictures all over my office, my home and my screensavers of Papa and Baby Bird, but when I am out and about and I am chatting with someone and they ask to see a picture of Baby Bird, I look like such a bad mom. I’m very digital and the time it takes to have my pictures printed out and then the time to pick them up (when I remember to) just isn’t time I have to spend. As soon as I received my digital keychain, I set out to download some pictures so I could always have my husband and daughter with me. The keychain holds 32MB worth of memory. That’s anywhere from 10 – 30 pictures depending on the size. The pictures rotate through so you can see a variety of images and the best part, it hooks directly up to your computer so you can remove pictures and download new ones. To top it off, the instructions were easy to follow. This keychain sells online at Wholesalekeychain.com for $9.99. And just a reminder that the Holidays are quickly approaching, this would make a great stocking stuffer. I also have one pink digital keychain to giveaway to one lucky This Bird’s Day reader. Leave a comment at the end of this post. Include a way of getting a hold of you if you win. *You must do this for any additional entries to count. Daily Entry: Tweet about this giveaway, linking to this post. Please include your twitter id in your comment. This contest is open to residents of Canada and the US and runs until 12pm MST on Wednesday, September 29, 2010. Comments for this giveaway are now closed. Thanks to everyone who entered. I will draw a comment and list on the winner’s page shortly. It’s a lovely little keychain and hey it’s in my favorite color. Really want to win this for my mom for xmas-going to check out the we site! What a cute keychain. I’d love to win it. off to check these out – i thought they were way more expensive! This would be great when people ask about our wedding! I checked out Wholesalekeychain.com and they have a wide variety of key chains. There is something to suit everyone! I always wanted one of these for my photos. THanks. I would give this to my mom, a great grandma to be, with baby photos! I like the Digital Keychain. I’d like to win this prize. That is the coolest, love it. I would keep it for myself, I never have any pictures of my husband and daughter to show cause I never bother printing them. Great gift for grandparents – perfect idea. This would be a nice idea for grandparents – That would be one Christmas gift down.